Make a one-time donation to the Revealed Treasures – Gong Ter Text Translation Project by selecting a one-time contribution amount below. Donate to the Gong Ter Text Translation Project each month by choosing a recurring donation amount below. This recurring donation will continue for two years or until completion of the project, whichever comes first. Ripa Ladrang Foundation has accepted the profound responsibility of sponsoring the Gong Ter translation project for H.E. Terton Namkha Drimed Rinpoche’s termas (Revealed Treasures). All beings who have received the blessings of these treasures or those who will receive such blessings in the future are impacted by these sacred revelations. And you are invited to join with Ripa Ladrang Foundation in the sponsorship of this sacred translation project. In 2014, in Switzerland and in 2015 in Nepal, His Eminence gave a full Gong Ter transmission of his treasures revealed during this lifetime. For those beings who were able to attend these sacred events, they reported that the enlightened glory that was transmitted was impossible to describe and moments never to be forgotten. However, most of the termas this Great Terton discovered in this lifetime are not yet translated. During his visit to Tibet, Padmasambhava (Guru Rinpoche) gave countless tantric teachings to King Trisong Detsen, the princes and to all of his close disciples. Guided by infinite love and compassion, most of these teachings were hidden to benefit future generations. These concealed teachings constitute the Terma lineage and are classified into two categories: the Earth Treasures and the Mind Treasures or Gong Ter. Before Guru Rinpoche left Tibet, he prophesied which of his disciples would be the Tertons who would discover these hidden treasures and approximately when they would be discovered. H.E. Terton Namkha Drimed Rinpoche was one of those close disciples of Guru Rinpoche and he has been a Terton in many lifetimes, revealing a very substantial amount of these hidden treasures. In this lifetime he has been especially active in terma discovery, revealing a very large amount of new teachings, most of which are not yet translated from Tibetan. His Eminence has been especially active in revelations related to Gesar, including peaceful, wrathful, magnetizing and enriching aspects. These have been called New Treasures or Revealed Treasures which are a full cycle of terma revelations on Gesar, the Warrior King of Tibet. In the new Regon Tashi Choeling Monastery in Nepal, an entire floor of the monastery depicts statues of Gesar in his various forms as well as his ministers. These visionary art forms are based upon the visions and past life recollections of this Great Terton. 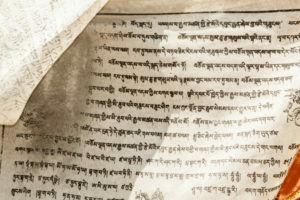 The Ripa Ladrang Foundation is very active with its Tibetan text translation and preservation program. The program has provided texts for over 14 years of teaching programs in the United States. This program is working closely with Lamas from the Ripa Lineage Nepal Monastery, in charge of this preservation work. You can email the foundation at gongtertexts@ripaladrang.org. The Earth Treasures were written in the symbolic languages such as the Dakini’s secret writing and they were hidden in the ground, rocks, trees and water by Dakini Yeshe Tsogyal and some of Guru Rinpoche’s main disciples. The Mind Treasures are also known as Gong Ter. Gong means “Awakened Mind”, a mind that is not confused and refers to one who resides in the true nature of mind and phenomena. The general meaning of Ter is “Endless” in the sense of extremely abundant like an ocean. In the same way, the blessings of Guru Rinpoche, the brief and extensive texts and their meaning flow profusely from the awakened minds of the Tertons to benefit all sentient beings. Specific to the Vajrayana Nyingma School of Tibetan Buddhism, the Termas can only be discovered by a Terton (someone who was a close disciple of Guru Rinpoche). These great spiritual masters of Tibetan Buddhism are actually all emanations of Guru Rinpoche. Over the centuries they have discovered the spiritual treasures hidden during the time of Padmasambhava. A Terton such as H.E. Namkha Drimed Rinpoche is an emanation of Guru Rinpoche and directly received his teachings in a previous life. This was the case of the twenty five great disciples. In past lives, H.E. Terton Namkha Drimed Rabjam Rinpoche was born as one of the greatest masters of India, the Mahasiddha Hunkara. And also in Tibet, in the Eighth Century as Lhopon Namkhai Nyingpo, one of the twenty-five main disciples of Guru Rinpoche, who accomplished a great level of realization. In his current life, he clearly remembers having been Gyatsa Zhalkar, the brother of Gesar. At the age of thirteen, he vividly met Guru Rinpoche in a vision and received his blessings. From that moment he repeatedly encountered the Three Roots, especially Gesar and his retinue and received blessings from all of them. As a result, his Mind Treasures (Gong Ter) started to arise in his mind stream. You are invited to participate in the sponsorship of this massive translation project which is projected to span several years. Please join us in this profound undertaking which will benefit beings for ages to come. The translators are already at work and although they are not being paid for their time, there are many expenses involved with a translation project of this magnitude. It is estimated that the total cost for this project is approximately $100,000. Any donation will be appreciated and will help. No donation is too small. Being a part of this Gong Ter mandala will be of tremendous karmic benefit to you and to all beings who will ultimately receive these teachings and texts. These are revelations of the hidden treasures of Guru Rinpoche meant for our time. You can email the foundation at gongtertexts@ripaladrang.org. How fortunate for everyone who participates in this Gong Ter translation project!